GUITAR virtuoso Vince Martinelli will display his incredible musical skills at the Wests Leagues Club tomorrow night. Martinelli performs a solo gig at the club each Thursday evening and the show has become successful enough to continue weekly. Originally from Italy, Martinelli has received acclaim from critics all over Australia who describe him as anything from exceptional to extremely entertaining and professional. The classical guitarist began learning the acoustic and electric guitars from a young age. His talent has lead him to perform with both international and national artists such as Jon English, Marcia Hines, Des O'Connor and Shirley Bassey. Martinelli has a masters degree in music and has also studied guitar at the Centro Romana della Gitarra in Rome. 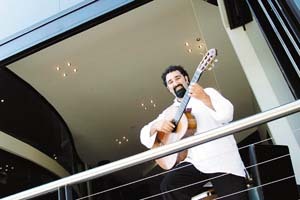 In recent years Martinelli has continued his study of guitar through the introduction of Spanish Flamenco music. Martinelli has also released his first solo album and performs in the Wine and Roses duo with saxophonist and vocalist Rita Scott. The group perform a mix of easy listening, dance and jazz music and have become one of the most popular duos in the Hunter region.